We dreamed all winter about these warm summer nights, and we intend to enjoy every last minute. Outdoor summer concerts are the perfect way to spend a languid evening under the stars in the company of friends and family. The Britt Festival kicks off its 50th season with performances from June through October in the historic town of Jacksonville in Southern Oregon. Blues, pop, rock, classical and jazz stars like Melissa Etheridge, Leftover Salmon, Diana Krall and Michael Franti perform in a natural amphitheater set among majestic ponderosa pines and native madrone trees. Stick around to enjoy some of the oldest vineyards in the state in Applegate Valley wine country. the night in the beautifully renovated 1911 county poor farm turned hotel, and enjoy the onsite brewery, distillery, restaurant and Ruby’s Spa at the western edge of the Columbia River Gorge. 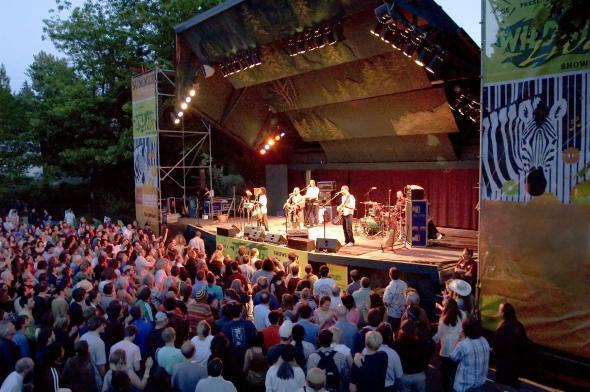 The Oregon Zoo kicks off its summer concert series with the B-52s — the World’s Greatest Party Band. Over the course of the summer, the zoo will feature other star power like Ziggy Marley, k.d. lang, Buddy Guy and Pink Martini on the big concert lawn. The zoo’s new Wednesday night series for members, Sunset at the Zoo, will include local musicians, Northwest food and wine and fun family activities. Get our summer groove on!